Buyer demand and consumer confidence are both high right now. With interest rates expected to surpass 5% by the end of the year, buyers started viewing properties early. You decided to put your Havasu home on the market. You’ve completed your “honey do” list, i.e., found an agent, cleaned up the place, and fixed the little things that you’ve avoided addressing. 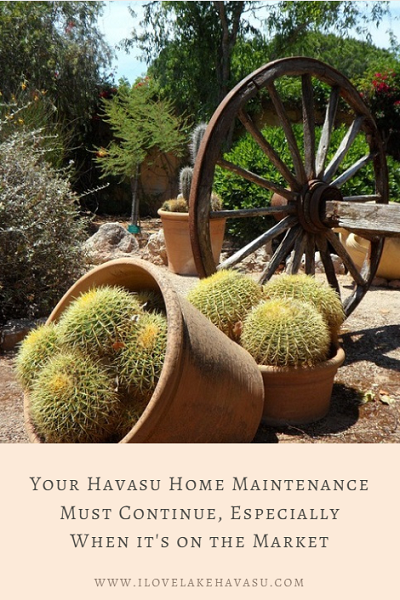 But don’t forget your regular Havasu home maintenance. You need to keep up normal maintenance tasks even while your home is on the market. This rings especially true if it sits vacant. First impressions become lasting impressions. Curb appeal ranks high on buyers’ lists. A poorly kept exterior might keep them from investigating the interior. Weed regularly and make sure all walkways remain clear. If a buyer needs a jungle guide to get to your front door, they’re not going to think it’s worth the effort. So, one of the chores on your Havasu home maintenance list should include trimming back any overgrown brush or trees. Next thing to check on your Havasu home maintenance list? The roof. It’s one of the items on every home inspection. Look for broken tiles, torn shingles, and cracks of any kind. If you take care of these issues before you list your property, the inspection will only show that your roof is well maintained. Living in the desert, we deal with a lot of dust. That means dirty windows. Thoroughly clean your windows both inside and outside each week. Don’t forget to wipe down the window sills. Also, do this just before you know that your REALTOR@ will be showing your home to a potential buyer. Dirty, dusty windows make the interior of your home appear dirty and dusty, too. That’s NOT a look you want buyers to see. As residents of Lake Havasu City, we all know how hot it can get. Call an HVAC company out to service your air conditioning unit right now, before the temperatures begin to rise. During the hottest months of the year, change your filter regularly. This ensures that the unit works correctly and efficiently, keeping guests cool. On the flip side, your heating system should be serviced as well. While you don’t use it as much as your air conditioner, you do want to have it working when needed. Finally, you need to keep wild animals and bugs out of your home. This should always be a part of your Havasu home maintenance. You can employ a service to come spray around your home regularly for a reasonable price. This keeps the creepy crawlies out. As for the birds, mice, and, sometimes, scorpions that might make their way inside? Check the exterior of your home for possible entry points like holes and open vents. Place a heavy gauge wire mesh over the open areas to allow ventilation to continue uninterrupted while keeping pests out. This can be found at your local home improvement store. Just because you place your property on the market does not let you off the hook with your Havasu home maintenance. Until that house is in someone else’s name, you’re still responsible for its upkeep. And if you want to sell it, you’re going to have to continue taking care of these chores regularly.